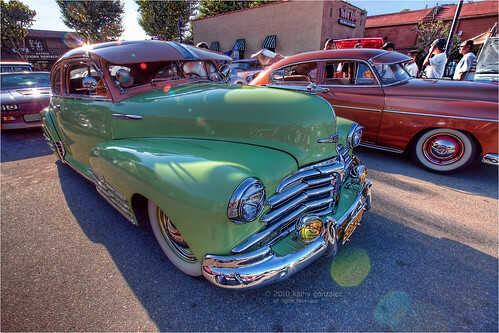 this 51 chevy was in the side lot at the garden grove main street show. it seemed more crowded than it had been recently, and there was an inordinate number of spectators in chairs around the judges' table. turned out that it was elvis day, and they were waiting for an impersonator to come out and put on a show. great for me, fewer people milling around the cars. if you look closely, there is an elvis on the balcony, not sure if it's the guy having a peek, or just a dummy — is there a difference? my friend with the cane, at the ruby's show later that evening, said it's always elvis day in garden grove. viva garden grove.